E-210 Cylinder Head; Small Block Chevy w/64cc. Combustion Chamber; For Use w/Mechanical Flat Tappet And Hydraulic Roller Camshaft Applications; Complete. Two Generations of Family Owned and Operated History. ADCO RV & Trailer Covers. Air Lift Air Spring Kit. Alloy USA Axle Kits Shafts. Anzo USA Head & Tail Lights. Bedrug - Truck & Van Rugs. Dee Zee - Truck Accessories. Draw Tite - Hitches Towing Acc. Fabtech - Lift Kits & Shocks. Go Rhino - Truck Accessories. Hellwig Sway Bars Load Control. Husky Liners - Floor/Cargo Mat. Jet Chips - Performance Chips. KC Hilites OFF ROAD LIGHTING. LUK Clutch kit & Components. Lund Nerf Bars Tonneau Covers. Marinco - RV & Boat Electrical. Meyer Snow & Ice Removal Equip. N-Fab NERF BARS LIGHT BARS. Pop and Lock TAILGATE LOCKS. Pro Comp Alloy - Alloy Wheels. Pro Comp Off Road Accessories. Readylift - Lift Kits & Shocks. Reese Hitches and Towing Acc. Rubicon - Lift Kits, Steering. Street Scene - Body Styling. Surco Luggare Bike Roof Rack. Tow Ready Hitch Balls mounts. Warn - Winches & Accessories. Westin Nerf Bull Bars Bumpers. 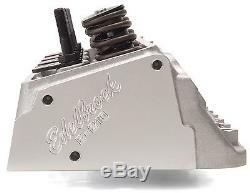 Edelbrock 5087 E-210 Cylinder Head. Fully Compatible With OEM Equipment. Can Support 500+ Horsepower/6500 RPM. Larger Runners For Increased Airflow. Revised Exhaust Ports/Larger Diameter Springs. Ideal For Spec Series Racer. Exhaust Port Flange In Stock Location. When you design and sell the best-engineered performance products in the world, you have to have a rigorous testing program. Without adequate testing, there's no way to stand behind your product with confidence. That's why every product we design and sell at Edelbrock is tested and approved by Edelbrock engineers in a real world environment on state-of-the-art equipment. Our three Super Flow computerized engine dynos are capable of measuring 11 separate engine variables up to speeds of 12,000 rpm. For 2007, we added a new Super Flow SF902 engine dyno. It's fully automated and programmable to simulate various driving situations, and is equipped with WinDyn software for the very latest in testing equipment. For real-world tuning, there's our Super Flow model SF-840 eddy-current chassis dyno that can handle up to 1,000 hp at the wheels and speeds of 200 mph. When all testing is completed, the results evaluated, and the part has passed all performance criteria, then, and only then, is the product deemed ready for production. These precise testing procedures are applied to the entire Edelbrock line for performance that's guaranteed. Edelbrock test vehicles are driven by Edelbrock engineers and employees to get a "real world" feeling for the performance improvements. Our products are also tested and used by professional race car teams and drivers. Working with these talented individuals is just another extension of our research and development process so when we say "proven performance" we really mean it! Top racing teams in all forms of motorsports rely on Edelbrock to produce parts that they can count on to win races and championships. Founded in 1967 as central New York's premier engine, machine and speed shop, today's Burkart Automotive represents two generations of family-owned and operated history. As the area's racing and performance hotspot, Burkart Automotive helped mainstream drag racing by bringing such big names as Bruce Larson, Tommy Ivo, King and Marshall and an array of other kings of the quarter mile on site for appearances as they worked their way across the northeast racing circuit. Burkart Automotive specializes in engine building and machine work, 4x4 and off road accessories, and speed and performance gear. The mission of the team at Burkart Automotive is simple - to be the best choice in the industry for your high-quality speed and performance needs. Whether it's a simple part or a high-performance custom engine, we want your experience to be just right. All retruns must be in original box unopened. We reserve the right to refuse any return. Burkart Automotive 114 Oriskant Blvd. 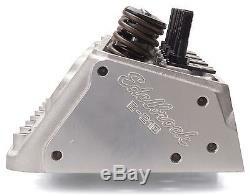 The item "Edelbrock 5087 E-210 Cylinder Head Small Block Chevy with64cc. Combustion Chamber" is in sale since Tuesday, June 06, 2017. This item is in the category "eBay Motors\Parts & Accessories\Car & Truck Parts\Engines & Components\Cylinder Heads & Parts". The seller is "burkartautomotive" and is located in Multiple Warehouses. This item can be shipped to United States, Canada, United Kingdom, Denmark, Romania, Slovakia, Bulgaria, Czech republic, Finland, Hungary, Latvia, Lithuania, Malta, Estonia, Australia, Greece, Portugal, Cyprus, Slovenia, Japan, China, Sweden, South Korea, Indonesia, Taiwan, South africa, Thailand, Belgium, France, Hong Kong, Ireland, Netherlands, Poland, Spain, Italy, Germany, Austria, Israel, Mexico, New Zealand, Singapore, Switzerland, Norway, Saudi arabia, Ukraine, United arab emirates, Qatar, Kuwait, Bahrain, Croatia, Malaysia, Brazil, Colombia, Panama, Jamaica.